While at the Bella Tica Organic Coffee Farm, We had the experience to see how coffee beans are processed on another small-scale farm operation. Oldemar Salazar shared with us that he had spent his entire life in this area and his love for coffee season has only blossomed with the years. For the past 9 years, he has been going from seed to coffee so no longer would he have to sell his seeds to someone far away who would roast them. There are 4 stages that Oldemar works with when roasting his coffee beans: cherries, pergamino, grano de aro, and finally roasted bean. The first step is to remove the red coating from the seeds; an interesting fact that was shared with us was that 75 to 80% of the cherries will produce 2 coffee seeds. The seeds are then introduced to water which destroys the exterior membrane. For the next 30 days, the seeds are dried on drying mats and then an additional 3 months is required before the beans head to the next step. It is important to note that there are 3 layers on the beans that protect them from air contamination and spoilage. 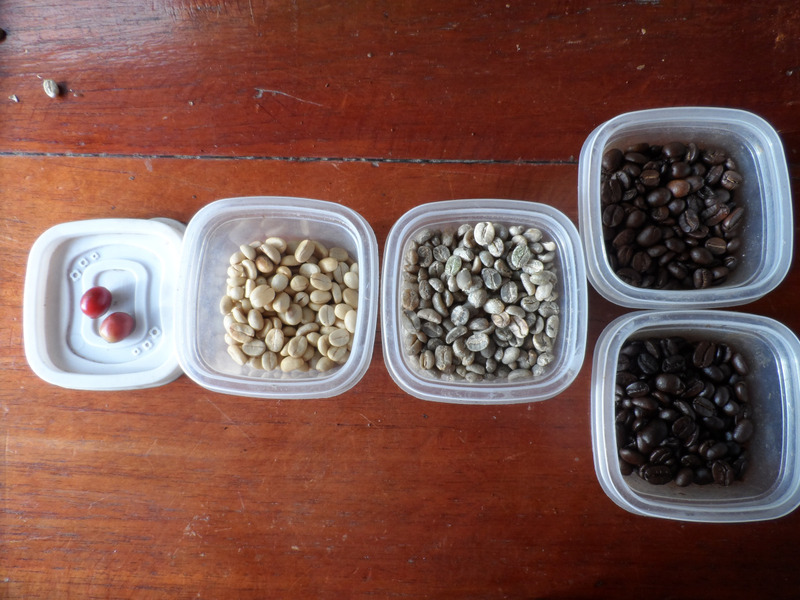 The stages of the coffee beans during processing from left to right. The last column shows the two different kinds of roast, medium (top) and dark (bottom). Traditionally, a mortar and pestle contraption would be used to remove the outer skin from the desired coffee bean and then the ventilation (i.e. wind) would blow away the broken up layers leaving behind the product. Now a mechanized version of this is used to save on time and labor. The coffee beans are then sent to a 5 kg capacity roaster. Gas is fed into the roaster to heat the system, while electricity is used to power the rotator which promotes even roasting. To obtain a medium roast it takes 23 hours in the roaster, where only 2 more hours are needed to obtain a dark roast. You can see that there is a minimal window Oldemar has to make sure his beans are roasted to perfection. Excluding the drying time, the mechanized portion of this process takes roughly 8 hours to complete roasting. Oldemar can produce about 50 pounds per day which are then sold in his store. He sells his beans both whole and ground, which is done by using a homemade grinder that was assembled using motorcycle parts and other materials. With our amazing learning experience and newly purchased roasted coffee beans, the group headed back to UGA-CR. We visited in Finca La Bella that both grew coffee plants and produced their own brand of organic coffee, La Bella Tica. We found out that this is one of the brands of coffee that the UGA cafeteria buys (definitely one of my favorite perks of being in Costa Rica—great coffee!). By completing the entire process of coffee production themselves, from growing the plant to packaging the roasted beans, they are able to make more money for their final product than they would if they only sold the unprocessed beans. We’ve been to a lot of coffee farms, but no two have been the same. Each farmer has to make choices in order to both preserve the environment and provide for their family, and it’s impressive the commitment many of these farmers make to sustainability, such as growing polycultures and avoiding chemicals. One of the main themes that has arisen in our class discussions is how education is key—and in this case, it’s only education of the consumer that will encourage farmers to continue investing in these sustainable practices. After our tour we ate lunch on the farm, which was delicious and a nice change of pace from the cafeteria lunches. We enjoyed a nice dish that included rice, beans, veggies and fruit.